The Navy Midshipmen football team represents the United States Naval Academy in NCAA Division I FBS (Football Bowl Subdivision) college football. The Naval Academy completed its final season as an FBS independent school (not in a conference) in 2014, and became a single-sport member of the American Athletic Conference beginning in the 2015 season. The team has been coached by Ken Niumatalolo since December 2007. Navy has 19 players and three coaches in the College Football Hall of Fame and won the college football national championship in 1926 according to the Boand and Houlgate poll systems. The 1910 team also was undefeated and unscored upon (the lone tie was a 0–0 game). The mascot is Bill the Goat. Navy's first football team gathered for a team portrait in 1879. The Naval Academy's football program is one of the nation's oldest, with its history dating back to 1879. There were two separate efforts to establish a Naval Academy football team in 1879. The first was guided by first-classman J.H. Robinson, who developed it as a training regiment to help keep the school's baseball team in shape. The team played the sport under rules that made it much closer to soccer, where the players were permitted only to kick the ball in order to advance it. The second effort, headed by first-classman William John Maxwell was more successful in its efforts. Maxwell met with two of his friends, Tunstall Smith and Henry Woods, who played for the Baltimore Athletic Club and officially challenged their team to a game with the Naval Academy. A team was formed from academy first-classmen, which Maxwell led as a manager, trainer, and captain. The team would wake up and practice before reveille and following drill and meals. The squad received encouragement from some of the faculty, who allowed them to eat a late dinner and skip final drill for additional practicing. This was against the direct orders of the school superintendent, who had banned football and similar activities. The game, played under rugby rules, was a battle from beginning to end—a regular knock down and drag out fight. Both sides became immediately excited and the audience was aroused to the highest pitch of enthusiasm by the spirited contest. The ball oscillated backward and forward over the ground without any material result. The scrimmages were something awful to witness—living, kicking, scrambling masses of humanity surging to and fro, each individual after the leather oval. If a Baltimorean got the ball and started for a run, he was unfailingly caught by one of the brawny Cadets and dashed to earth with five or six men falling on him. The game was closely fought and was finally declared a scoreless tie by the referee about an hour after it began. Navy reportedly never gained possession of the ball. However, the Naval Academy managed to keep the Baltimore Athletic Club from ever being in a scoring position. On three separate occasions, Navy forced Baltimore back into its own end zone for a safety; these were not worth any points until 1882, however, so they offered Navy no benefit. The American and Chronicle reported that Maxwell, Craven, and Sample of Navy gave the strongest performances, but were also reckless in their play and were repeatedly penalized for jumping offside or kicking the ball out of play, a form of delay of game. Some time after the game, Walter Camp, known as the "Father of American Football", credited Maxwell as the inventor of the first football uniform. After he was informed that the Baltimore team he was playing outweighed his by an average of ten pounds, Maxwell looked for a way to make the teams more evenly matched. Using his knowledge of sailing, he decided to design a sleeveless canvas jacket which would make his players "difficult to grasp when they began to sweat". He presented the design to the academy's tailor, who created the double-lined jackets which "were laced down the front and drawn tightly to fit snugly around a player's body". The weighted suits were worn by the team, which was confused by the "strangle, heavy, newfangled getups". The Naval Academy would not produce another football team until the 1882 season. The 1882 team would be the first with a coach, being supported by Academy officials. The 1879 season was the last time that a Navy squad would play the Baltimore Athletic Club. Navy would finish the 1880s with four winning seasons, and an overall record of 14–12–2, with one of those ties being the game against the Baltimore Athletic Club. Navy would outscore their opponents 292–231, and would finish the 19th century with an overall record of 54–19–3. The lack of a coach for the 1879 season was one of the two times the Naval Academy squad lacked one, the other time being from 1883 through 1891. Frank Berrien served as Navy's head football coach from 1908–1910, compiling a record of 21–5–3. He was the thirteenth head coach of the Naval Academy's football program and, under his tutelage, the Midshipmen compiled an undefeated 8–0–1 mark in 1910. Three undefeated teams with nearly identical records would cause a stir among fans and pollsters today, but this was the case when Navy earned its lone national championship in 1926, as the Midshipmen shared the honor with Stanford and Alabama. A 7–7 tie between Alabama and Stanford in the 1926 Rose Bowl gave Stanford a 10–0–1 mark, while the Crimson Tide and the Mids each had identical 9–0–1 records. The Midshipmen opened the '26 season with a new coach, Bill Ingram. A Navy football standout from 1916 through 1918, Ingram took over a Navy team that had only won seven games in the previous two seasons combined. One of the keys to Navy’s 1926 squad was a potent offense led by All-America tackle and team captain Frank Wickhorst, who proved to be a punishing blocker for the Navy offense. One member of the Navy offense that appreciated the blocking of Wickhorst was Tom Hamilton. The quarterback and kicker had a pair of 100-yard rushing games en route to All-America honors. Navy's biggest win that year was against Michigan in front of 80,000 fans in Baltimore. The Mids scored 10 second half points to upset the Wolverines, 10–0. Navy’s offense tallied 165 yards behind the powering attack of Hamilton and Henry Caldwell who scored Navy’s lone touchdown on a one-yard plunge. Jubilation from the victory continued after the game, as the Midshipmen tore down the goal post at each end of the field and carried away all the markers that lined both sides of the field. Navy headed into its season finale against Army with a 9–0 record. The game was to be played in Chicago at Soldier Field, which had been built as a memorial to the men killed in World War I. It was only natural Army and Navy would be invited to play the inaugural contest there. James R. Harrison of the New York Times described the game as "the greatest of its time and as a national spectacle." Over 110,000 people witnessed the Midshipmen open up a 14–0 lead on the Cadets, only to see Army fight back to take a 21-14 lead early in the third quarter. The Navy offense responded behind its strong ground game led by running back Alan Shapley. On fourth down and three yards to go, Shapley ran eight yards for a touchdown to tie the game at 21. As the final quarter concluded, Army mounted a brief threat only to miss a 25-yard field goal. The tie gave the Midshipmen a share of the national championship based on retroactive rankings by both the William Boand and Deke Houlgate mathematical poll systems. Navy was one of the very few programs to field a football team during World War II, with John Whelchel leading the Midshipmen from 1942-1943 and Oscar Hagberg serving as head coach from 1944–1945. During those years, three of the four Navy teams finished ranked in the top 10 of the final AP poll. George Sauer left his post as Kansas head coach and took over in Annapolis from 1948-1949. The Midshipmen struggled under Sauer's tutelage, posting a 3–13–2 record which included a winless 1948 season. Eddie Erdelatz returned to Navy, where he'd previously served as an assistant coach from 1945–1947, to take over a football program that had won just four games over the previous five seasons. In 1950, Erdelatz led an upset of arch-rival Army. The Black Knights entered the game with an 8–0 record which had not lost in 28 contests. Army also had defeated Navy five times in the last six games. Although Navy had only a 2–6 record, an outstanding defensive effort resulted in a 14–2 victory for the Midshipmen. After two years at Navy, Erdelatz's record stood at 5–12–1, but he would never again have a losing season in his final seven seasons and would finish 5–3–1 in his games against Army. In 1954, the team finished 8–2, losing close games to Pittsburgh and Notre Dame. Erdelatz labeled this squad, "A Team Called Desire" and then went on to shut out Ole in the 1955 Sugar Bowl. Three years later, the Midshipmen competed in the Cotton Bowl Classic, where they knocked off Rice University, 20–7. The latter win came one year after Navy's bid to play in a bowl game was rejected despite having only one loss. After the bowl victory over Rice, Erdelatz was courted by other schools and nearly accepted the task of replacing Bear Bryant at Texas A&M University. After the 1958 season, he was also seen as a candidate for the NFL's San Francisco 49ers head coaching job, but began spring practice the following year at Navy. On April 8, 1959, Erdelatz resigned as head coach of the Midshipmen, citing a number of factors, including the desire for an easier schedule. From 1959 to 1964, Wayne Hardin was the head coach at Navy, where he compiled a 38–22–2 record. His Navy teams posted five consecutive wins against archrival Army, a feat not surpassed until 2007 when Paul Johnson's Navy squad won their sixth consecutive contest in the Army–Navy Game. Hardin coached Navy's two winners of the Heisman Trophy, Joe Bellino, who received the award in 1960, and Roger Staubach, who did so in 1963. Hardin was the first to coach an African-American player at Navy when Dr. Calvin Huey earned a letter in 1964. Hardin resigned as Navy's head coach following a 3–6–1 record in 1964. Virginia head coach Bill Elias replaced Hardin, and the Midshipmen struggled mightilty under Elias' leadership. Elias' Midshipmen posted a 15–22–3 record in his four seasons, which included three non-winning seasons. Elias was fired following a 2–8 season in 1968. Former UConn head coach Rick Forzano was hired as Elias' replacement in 1969. However, the Midshipmen's struggles continued, with Navy failing to post a single winning season, something that hadn't occurred in Annapolis in decades. Forzano's teams posted yearly records of 1–9, 2–9, 3–8 and 4–7. Forzano resigned after the 1972 season. Penn State assistant coach and Navy alum George Welsh succeeded Forzano as Navy's head coach. He inherited a Navy Midshipmen football program that had only had one winning season since the days of Roger Staubach. He led the Midshipmen to three bowl game appearances and their first nine-win season in 16 years. In nine seasons, Welsh compiled a record of 55–46–1, making him the service academy's most successful coach. In 1982, Welsh left Navy to become the head coach at Virginia. West Virginia offensive coordinator Gary Tranquill was hired as Welsh's replacement in 1982. Tranquill's Midshipmen compiled a 6–5 record in 1982, but it was downhill from there. 1983 saw a 3–8 record followed by back-to-back four-win seasons in 1984 and 1985. A 3–8 campaign in 1986 ended Tranquill's tenure at Navy as the school declined to renew his contract. One notable assistant coach during this time was Nick Saban, the legendary head coach at Alabama[better source needed]. Former Western Michigan head coach Elliot Uzelac was hired by Navy to serve as the school's 34th head football coach in 1987. Navy's struggles continued, with the Midshipmen posting records of 2–9 in 1987 followed by back-to-back 3–8 seasons in 1988 and 1989. Uzelac was fired following the 1989 season. Marshall head coach George Chaump was hired as Uzelac's replacement in 1990. Chaump was unable to revive the Midshipmen football program, compiling a record of 14–41 in five seasons. Chaump's Midshipmen posted back-to-back 1–10 records in 1991 and 1992. Navy fired Chaump after the 1994 season in which the Midshipmen finished 3–8. Utah State head coach Charlie Weatherbie was hired to replace Chaump in 1995. 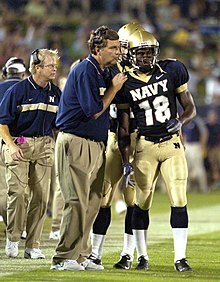 Under Weatherbie, Navy did have a couple of winning seasons, the first coming in 1996 with a record of 9–3 with a win in the Aloha Bowl. That was followed with a 7–4 campaign the following year. After that, however, Navy struggled, failing to post a record better than a 5–7 record. After a 1–10 season in 2000 followed by an 0–7 start to the 2001 season, Weatherbie was fired. In 2002, Paul Johnson departed Georgia Southern and was hired as the 37th Navy head football coach. Johnson's initial season saw the Midshipmen win only two of 12 games, though the season ended on a high note with his first victory over Army, which would not beat Navy again until 2016. Subsequently, Johnson's teams enjoyed a high degree of success. 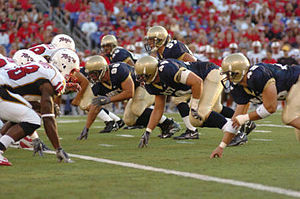 The 2003 team completed the regular season with an 8–4 mark, including wins over both Air Force and Army, and earned a berth in the Houston Bowl, Navy's first bowl game since 1996. However, the Midshipmen lost to Texas Tech, 38–14. In 2004, Johnson's team posted the program's best record since 1957, finishing the regular season at 9–2 and once again earning a bowl berth, this time in the Emerald Bowl. There Johnson coached the Midshipmen to a win over New Mexico, 34–19, the fifth bowl win in the school's history. The win gave Navy 10 wins on the season, tying a school record that had stood since 1905. For his efforts, Johnson received the Bobby Dodd Coach of the Year Award. The 2005 Navy squad recorded a mark of 8–4, highlighted by victories over Army, Air Force, and Colorado State in the Poinsettia Bowl. In 2007, Johnson coached the Midshipmen to their first win over rival Notre Dame since 1963, winning 46–44 in triple-overtime. Navy finished the season with an 8–5 record. Johnson dominated the Commander-in-Chief's Trophy competition, going 11–1 (.917) in his six years, with the only loss against another service academy coming at the hands of Air Force in his first season. He was the first coach in Navy's history to go 6–0 in his first six seasons against Army (Ken Niumatalolo, who followed Johnson at Navy, went 8–0 against Army in his first eight seasons), and his 2006 senior class was the first in Navy history to win the Commander-in-Chief's Trophy all four of their years. Much of Johnson's success at Navy was predicated on his triple option flexbone offense, a run-oriented attack that led NCAA Division I-A/FBS football in rushing yards three of his last four years at Navy. Johnson departed Navy for the head coaching position at Georgia Tech after the end of the 2007 regular season. Ken Niumatalolo was promoted from offensive line coach to head football coach of the Naval Academy football team on December 8, 2007 after Johnson's departure for Georgia Tech. Niumatalolo is the 38th head football coach in Naval Academy history. On January 7, 2009, Niumatalolo was given a contract extension, although terms and length of the extension were not released. With Niumatalolo as Navy's head coach, beginning with the 2008 season, the Mids have continued their run of success. Highlights in 2008 included an upset in Winston-Salem over #16 Wake Forest, 24–17, the Mids' first victory over a ranked team in 23 years, and a 34–0 shutout victory of Army. Other highlights of Niumatalolo's years as head coach at Navy include: Navy defeated Army in each of Niumatalolo's first eight seasons as head coach, not losing to Army until 2016. The 2016 loss ended a streak of 14 Midshipmen wins in the Army–Navy Game, the longest winning streak for either side in the rivalry. The Midshipmen captured the Commander-in-Chief's Trophy in 2008, 2009 and 2012. They went on to capture the trophy outright in 2013, with a 34–7 win against Army, and recaptured it outright in 2015 with wins over Army and Air Force. The Midshipmen have nine winning seasons during Niumatalolo's 11 full years as head coach. The Mids have played in nine bowl games during Niumatalolo's tenure, winning the 2009 Texas Bowl, 2013 Armed Forces Bowl, 2014 Poinsettia Bowl, and 2015 Military Bowl. Navy defeated longtime rival Notre Dame in consecutive years, 2009 and 2010, for the first time since the early 1960s. The Midshipmen also defeated Notre Dame in 2016, when the Midshipmen went on to finish with a 9–5 record. Niumatalolo led Navy into the American Athletic Conference after 134 years as an independent in 2015, the first time Navy joined a conference in the school's history. Three undefeated teams with nearly identical records would cause a stir among fans and pollsters today, but this was the case when Navy earned its lone national championship in 1926, as the Midshipmen shared the honor with Stanford and Alabama. A 7–7 tie between Alabama and Stanford in the 1927 Rose Bowl gave Stanford a 10–0–1 mark, while the Crimson Tide and the Mids each had identical 9–0–1 records. Navy headed into its season finale against Army with a 9–0 record. The game was to be played in Chicago at Soldier Field, which had been built as a memorial to the men killed in World War I. It was only natural Army and Navy would be invited to play the inaugural contest there. James R. Harrison of the New York Times described the game as "the greatest of its time and as a national spectacle." Over 110,000 people witnessed the Midshipmen open up a 14–0 lead on the Cadets, only to see Army fight back to take a 21–14 lead early in the third quarter. The Navy offense responded behind its strong ground game led by running back Alan Shapley. On fourth down and three yards to go, Shapley ran eight yards for a touchdown to tie the game at 21. As the final quarter concluded, Army mounted a brief threat only to miss a 25-yard field goal. Navy has participated in 23 bowl games, garnering a record of 11–11–1. 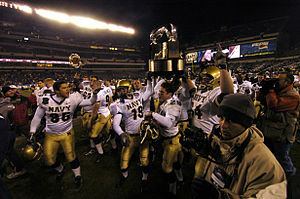 Navy celebrates after winning the 2005 Army–Navy Game on December 3, 2005. The Army-Navy Game, played annually on the last weekend of the college football regular season in early December, pits the football teams of the U.S. Military Academy at West Point, New York (Army) against the Navy Midshipmen. It is one of the most traditional and enduring rivalries in college football, and is televised every year by CBS. It was in the 1963 Army–Navy game that instant replay made its television debut. This game has always had inter-service "bragging rights" at stake; in past decades, when both Army and Navy were often national powers, the game occasionally had national championship implications. However, as top-level college football has developed and grown, the high academic entrance requirements, height and weight limits, and the military commitment required of West Point and Annapolis graduates has reduced the overall competitiveness of both academies in comparison with other football programs. While Army has had a resurgence in recent years, Navy has struggled to keep pace. However, the tradition of the game has ensured that it remains nationally televised to this day. One of the great appeals of this game to many fans is that its players are largely playing for the love of the game, since almost none will ever play in the NFL. The game is especially emotional for the seniors, called "first classmen" or "firsties" by both academies, since it is typically the last competitive football game they will ever play. During wartime, the game is even more emotional because some seniors may not return once they are deployed. For instance, in the 2004 game, at least one senior from the class of 2003 who was killed in Iraq, Navy's J. P. Blecksmith, was remembered. The players placed their comrade's pads and jerseys on chairs on the sidelines. Much of the sentiment of the game goes out to those who share the uniform and who are overseas. Army-Navy is played in early December, typically in Philadelphia. The game, however, has also been played in other locations such as New York, Baltimore, Chicago, and Pasadena. The Commander-in-Chief's Trophy is awarded to each season's winner of the triangular college football series among the United States Military Academy (Army), the United States Naval Academy (Navy), and the United States Air Force Academy (Air Force). Navy controlled the trophy from 2003 to 2009, marking one of the longest times any academy has had possession of the prestigious trophy. Typically, the Navy–Air Force game is played in early October followed by Army-Navy in early December. When Navy has possession of the trophy, it is displayed in a glass case in Bancroft Hall, the Midshipmen's dormitory. Navy has won 15 Commander-in-Chief's Trophies (1973, 1975, 1978, 1979, 1981, 2003, 2004, 2005, 2006, 2007, 2008, 2009, 2012, 2013, 2015). Navy has played Notre Dame in 87 annual games without interruption since 1927 with a record of 13–76–1. Notre Dame plays this game to repay Navy for helping to keep Notre Dame financially afloat during World War II. This series is scheduled to continue indefinitely. From 1963, when Navy beat Notre Dame 35–14, to 2006, Notre Dame won 43 consecutive games against Navy, the longest such streak in Division 1-A football. This streak ended on November 3, 2007, when Navy beat Notre Dame 46–44 in triple overtime. Navy also bested Notre Dame in 2009 and 2010, which made the class of 2011 only the third class in Navy history to have beaten Notre Dame three times. Navy won 28-27 in 2016, making Coach Niumatalolo only the second coach in Navy history to defeat Notre Dame three times. When Navy is the home team for this game in even-numbered years, the Midshipmen have hosted the game off-campus at large stadiums used by NFL teams, usually FedExField in Landover, Maryland or M&T Bank Stadium in Baltimore. The Midshipmen have also hosted the Irish at John F. Kennedy Stadium and Veterans Stadium in Philadelphia. A snap during the 2005 Navy-Maryland game. This rivalry stems from Navy and Rutgers being two of the only three programs (the third is Army) to come out of the original, informal "Ivy League" that are still members of the top tier of NCAA college football (currently Division I-FBS). Although the two teams only began a regular series relatively recently in 1995, the games between the two schools are often close and sometimes have controversy as in the 2004 and 2007 editions of the series. The rivalry dates to 1891, making the two schools each other's oldest active football rivals. The schools have met 25 times, with Rutgers leading the series at 13–11–1 all-time after the 2014 Navy loss. Navy and Rutgers have played most years since 1995, but do not have additional games scheduled at this time with Rutgers' move to the Big Ten and Navy's move from independents to the American. The Gansz Trophy was created in 2009 through a collaboration between the athletic departments of the Naval Academy and Southern Methodist University. The trophy is named for Frank Gansz who played linebacker at the Naval Academy from 1957 through 1959. Gansz later served on the coaching staffs at numerous colleges, including all three service academies and Southern Methodist, as well as several professional teams. The two teams have met 18 times with Navy leading the all-time series 11–7, and the trophy series 5–0. Navy and Pittsburgh recently renewed their rivalry, which began in 1912, and was played 26 times in 29 years between 1961 and 1989. The contest was then played consecutively between 2007 and 2009 and again in 2013. After a 44–28 victory for Navy in the 2015 Military Bowl in Annapolis, the series now stands with Pitt leading 22–15–3. Of historic interest, it was during the Pitt-Navy game at Annapolis on October 23, 1976, that Pitt running back Tony Dorsett broke the NCAA career rushing record. "The Most Prestigious Scholarships In College Football Since 1959"
For football players in the USNA Athletic Hall of Fame, see footnote. The Athletic Hall of Fame is housed in Lejeune Hall. Among the exhibits are two Heisman Trophies, won by Joe Bellino in 1960 and Roger Staubach in 1963. Ricketts Hall – This building contains the locker room for the varsity football team and offices for football, basketball, and lacrosse. It also contains the Jack Lengyel Sports Conditioning Facility, which is one of three "strength and conditioning facilities" at the academy. The weight-room facility serves football, men's lacrosse, baseball and wrestling. Rip Miller Field – Named for Edgar Miller, who was the Navy head football coach for three seasons (1931–1933). The field is used by both lacrosse and sprint football. Wesley Brown Field House – The field house has a full-length, 76,000-square-foot (7,100 m2), retractable Magic Carpet AstroTurf football field. ^ "American Athletic Conference Brand Standards Guide" (PDF). July 11, 2014. Retrieved November 8, 2016. ^ "Navy football officially joins AAC, ending 134 years as independent". National Collegiate Athletic Association (NCAA). July 1, 2015. Retrieved December 3, 2015. ^ a b c "OFFICIAL 2007 NCAA DIVISION I FOOTBALL RECORDS BOOK" (PDF). Archived from the original (PDF) on 25 June 2008. Retrieved 19 June 2017. ^ "The Official Web Site of Naval Academy Varsity Athletics". Navysports.Com. 2016-06-27. Archived from the original on 2013-11-06. Retrieved 2017-06-19. ^ a b c Anderson (2004), "Chapter 10: The Game"
^ Naval Academy Athletic Association (2005). "Navy: Football History" (PDF). 2005 Navy Midshipmen Football Media Guide. United States Naval Academy Athletics. p. 154. Retrieved April 29, 2014. ^ Castle, K.J. (January 5, 2011). "History of Navy Football". Livestrong.com. Early Years. Retrieved April 18, 2013. ^ "Frank Berrien Coaching Record | College Football at". Sports-reference.com. 1970-01-01. Retrieved 2017-06-19. ^ "1910 Navy Midshipmen Schedule and Results | College Football at". Sports-reference.com. 1970-01-01. Retrieved 2017-06-19. ^ "1943 Navy Midshipmen Schedule and Results | College Football at". Sports-reference.com. 1970-01-01. Retrieved 2017-06-19. ^ "1944 Navy Midshipmen Schedule and Results | College Football at". Sports-reference.com. 1970-01-01. Retrieved 2017-06-19. ^ "1945 Navy Midshipmen Schedule and Results | College Football at". Sports-reference.com. 1970-01-01. Retrieved 2017-06-19. ^ "George Sauer Coaching Record | College Football at". Sports-reference.com. 1970-01-01. Retrieved 2017-06-19. ^ "1948 Navy Midshipmen Schedule and Results | College Football at". Sports-reference.com. 1970-01-01. Retrieved 2017-06-19. ^ "SCOUTING REPORTS ON ARMY-NAVY—SAVE FOR USE SATURDAY, NOV. 27". Retrieved 19 June 2017. ^ a b c d By. "Navy got Army's goat in 1950". Washington Times. Retrieved 2017-06-19. ^ "1954 Navy Midshipmen Schedule and Results | College Football at". Sports-reference.com. 1970-01-01. Retrieved 2017-06-19. ^ "1955 - How They Got There / Allstate Sugar Bowl". www.allstatesugarbowl.org. Retrieved 19 June 2017. ^ 1 second ago. "Rice University Football :: Official Athletic Site". Riceowls.com. Retrieved 2017-06-19. ^ Maule, Tex. "A naval disengagement". Retrieved 19 June 2017. ^ "April 21, 1953 - Navy Coach to Aid All-Star Staff | Chicago Tribune Archive". Archives.chicagotribune.com. 1953-04-21. Retrieved 2017-06-19. ^ Special To The New York Times (1959-04-09). "Erdelatz, Hinting at Disagreement, Resigns as Navy Head Football Coach; ACADEMY FACING 'ACUTE PROBLEM' - NYTimes.com". Mobile.nytimes.com. Retrieved 2017-06-19. ^ "Wayne Hardin Coaching Record | College Football at". Sports-reference.com. 1970-01-01. Retrieved 2017-06-19. ^ "Wayne Hardin To Be Officially Enshrined Into College Football Hall of Fame - Temple University Athletics". Owlsports.com. Retrieved 2017-06-19. ^ "Heisman Trophy". Heisman.com. Retrieved 2017-06-19. ^ Wagner, Bill (14 September 2018). "Former teammates pay tribute to Calvin Huey, key figure in Navy football history". Retrieved 5 November 2018. ^ Times, Gordon S. White Jr ; Special To The New York (18 December 1964). "Hardin Resigns After 6 Seasons as Head Football Coach at Naval Academy". Retrieved 19 June 2017 – via NYTimes.com. ^ "William Elias Coaching Record - College Football at Sports-Reference.com". College Football at Sports-Reference.com. Retrieved 19 June 2017. ^ "Lubbock Avalanche-Journal from Lubbock, Texas on December 12, 1968 · Page 38". Retrieved 19 June 2017. ^ "Anderson Herald from Anderson, Indiana on January 16, 1969 · Page 13". Retrieved 19 June 2017. ^ "St. Petersburg Times - Google News Archive Search". news.google.com. Retrieved 19 June 2017. ^ "1969 Navy Midshipmen Schedule and Results - College Football at Sports-Reference.com". College Football at Sports-Reference.com. Retrieved 19 June 2017. ^ "1970 Navy Midshipmen Schedule and Results - College Football at Sports-Reference.com". College Football at Sports-Reference.com. Retrieved 19 June 2017. ^ "1971 Navy Midshipmen Schedule and Results - College Football at Sports-Reference.com". College Football at Sports-Reference.com. Retrieved 19 June 2017. ^ "1972 Navy Midshipmen Schedule and Results - College Football at Sports-Reference.com". College Football at Sports-Reference.com. Retrieved 19 June 2017. ^ Times, Special To The New York (2 February 1973). "NAVY COACH QUITS, JOINS LION STAFF". Retrieved 19 June 2017 – via NYTimes.com. ^ Times, Special To The New York (16 February 1973). "George Welsh Is Named Football Coach at Navy". Retrieved 19 June 2017 – via NYTimes.com. ^ a b "George Welsh Coaching Record - College Football at Sports-Reference.com". College Football at Sports-Reference.com. Retrieved 19 June 2017. ^ "1978 Navy Midshipmen Schedule and Results - College Football at Sports-Reference.com". College Football at Sports-Reference.com. Retrieved 19 June 2017. ^ "George Welsh Selected to College Football Hall of Fame". Retrieved 19 June 2017. ^ "Navy coach George Welsh has told his football players..." Retrieved 19 June 2017. ^ "Gary Tranquill, offensive coordinator at West Virginia, was expected..." Retrieved 19 June 2017. ^ "1982 Navy Midshipmen Schedule and Results - College Football at Sports-Reference.com". College Football at Sports-Reference.com. Retrieved 19 June 2017. ^ "1983 Navy Midshipmen Schedule and Results - College Football at Sports-Reference.com". College Football at Sports-Reference.com. Retrieved 19 June 2017. ^ "1984 Navy Midshipmen Schedule and Results - College Football at Sports-Reference.com". College Football at Sports-Reference.com. Retrieved 19 June 2017. ^ "1985 Navy Midshipmen Schedule and Results - College Football at Sports-Reference.com". College Football at Sports-Reference.com. Retrieved 19 June 2017. ^ Sell, Dave; Sell, Dave (8 December 1986). "Tranquill's Contract Not Renewed by Navy". Retrieved 19 June 2017 – via washingtonpost.com. ^ "Nick Saban". Wikipedia.com. Retrieved 8 January 2018. ^ "Army Vs. Navy: Winning Makes A Season Perfect College Football". Retrieved 19 June 2017. ^ "1987 Navy Midshipmen Schedule and Results - College Football at Sports-Reference.com". College Football at Sports-Reference.com. Retrieved 19 June 2017. ^ "1988 Navy Midshipmen Schedule and Results - College Football at Sports-Reference.com". College Football at Sports-Reference.com. Retrieved 19 June 2017. ^ "1989 Navy Midshipmen Schedule and Results - College Football at Sports-Reference.com". College Football at Sports-Reference.com. Retrieved 19 June 2017. ^ Cotton, Anthony; Cotton, Anthony (12 December 1989). "NAVAL ACADEMY DISMISSES FOOTBALL COACH UZELAC". Retrieved 19 June 2017 – via washingtonpost.com. ^ BEMBRY, JERRY (2 September 1990). "Chaump Is Determined to Revive Navy". Retrieved 19 June 2017 – via LA Times. ^ "George Chaump Coaching Record - College Football at Sports-Reference.com". College Football at Sports-Reference.com. Retrieved 19 June 2017. ^ "1991 Navy Midshipmen Schedule and Results - College Football at Sports-Reference.com". College Football at Sports-Reference.com. Retrieved 19 June 2017. ^ "1992 Navy Midshipmen Schedule and Results - College Football at Sports-Reference.com". College Football at Sports-Reference.com. Retrieved 19 June 2017. ^ "1994 Navy Midshipmen Schedule and Results - College Football at Sports-Reference.com". College Football at Sports-Reference.com. Retrieved 19 June 2017. ^ Nakamura, David; Nakamura, David (5 December 1994). "NAVAL ACADEMY DISMISSES CHAUMP AS FOOTBALL COACH". Retrieved 19 June 2017 – via washingtonpost.com. ^ "Navy hires Weatherbie from Utah State". Retrieved 19 June 2017. ^ "1996 Navy Midshipmen Schedule and Results - College Football at Sports-Reference.com". College Football at Sports-Reference.com. Retrieved 19 June 2017. ^ "ESPN Classic To Air 1996 Aloha Bowl Game". Retrieved 19 June 2017. ^ "1997 Navy Midshipmen Schedule and Results - College Football at Sports-Reference.com". College Football at Sports-Reference.com. Retrieved 19 June 2017. ^ "2000 Navy Midshipmen Schedule and Results - College Football at Sports-Reference.com". College Football at Sports-Reference.com. Retrieved 19 June 2017. ^ "2001 Navy Midshipmen Schedule and Results - College Football at Sports-Reference.com". College Football at Sports-Reference.com. Retrieved 19 June 2017. ^ "Navy fires Weatherbie in midst of winless season". Retrieved 19 June 2017. ^ "NAVYSPORTS.COM - The Official Web Site of Naval Academy Varsity Athletics - Paul Johnson Bio". Retrieved 19 June 2017. ^ "2002 Navy Midshipmen Schedule and Results - College Football at Sports-Reference.com". College Football at Sports-Reference.com. Retrieved 19 June 2017. ^ Valkenburg, Kevin Van. "Navy does number on Army as Candeto accounts for 7 TDs". Retrieved 19 June 2017. ^ "Army vs. Navy score: Black Knights power way to win, end 14-year losing streak". Retrieved 19 June 2017. ^ "2003 Navy Midshipmen Schedule and Results - College Football at Sports-Reference.com". College Football at Sports-Reference.com. Retrieved 19 June 2017. ^ "Red Raiders Capsize Navy In Houston Bowl". Retrieved 19 June 2017. ^ "2004 Navy Midshipmen Schedule and Results - College Football at Sports-Reference.com". College Football at Sports-Reference.com. Retrieved 19 June 2017. ^ "New Mexico vs. Navy - Game Recap - December 30, 2004 - ESPN". ESPN.com. Retrieved 19 June 2017. ^ "Bobbydoddfoundation.com". www.bobbydoddfoundation.com. Archived from the original on 2009-12-09. ^ "2005 Navy Midshipmen Schedule and Results - College Football at Sports-Reference.com". College Football at Sports-Reference.com. Retrieved 19 June 2017. ^ a b "Navy vs. Notre Dame - Game Recap - November 3, 2007 - ESPN". ESPN.com. Retrieved 19 June 2017. ^ "2007 Navy Midshipmen Schedule and Results - College Football at Sports-Reference.com". College Football at Sports-Reference.com. Retrieved 19 June 2017. ^ The Associated Press (8 December 2007). "Georgia Tech Hires Navy's Johnson". Retrieved 19 June 2017 – via NYTimes.com. ^ "Navy quickly promotes Niumatalolo to coach". Retrieved 19 June 2017. ^ "Niumatalolo follows Johnson at Navy". SportsIllustrated.com. Associated Press. 2007-12-08. Archived from the original on 2007-12-10. Retrieved 2007-12-13. ^ Navy coach Niumatalolo gets contract extension Archived 2009-04-05 at the Wayback Machine. Retrieved on 2009-01-08. ^ "Navy vs. Wake Forest - Game Recap - September 27, 2008 - ESPN". ESPN.com. Retrieved 19 June 2017. ^ "Navy Midshipmen vs. Army Black Knights - Box Score - December 6, 2008". www.foxsports.com. Retrieved 19 June 2017. ^ Cite error: The named reference Hiring ESPN was invoked but never defined (see the help page). ^ "Navy Vs Missouri". Retrieved 9 March 2014. ^ Hawkins, Stephen. "Navy wins Armed Forces Bowl 24-6 over MTSU". Retrieved 9 March 2014. ^ "Navy vs. Notre Dame - Game Recap - November 7, 2009 - ESPN". ESPN.com. Retrieved 19 June 2017. ^ "Notre Dame vs. Navy - Game Summary - October 23, 2010 - ESPN". ESPN.com. Retrieved 19 June 2017. ^ "Notre Dame vs. Navy - Game Recap - November 5, 2016 - ESPN". ESPN.com. Retrieved 19 June 2017. ^ "2016 Navy Midshipmen Schedule and Results - College Football at Sports-Reference.com". College Football at Sports-Reference.com. Retrieved 19 June 2017. ^ "Navy football officially joins AAC, ending 134 years as independent". 1 July 2015. Retrieved 19 June 2017. ^ "College GameDay Travels to Army/Navy for Third Straight Year - ESPN MediaZone". espnmediazone.com. Retrieved 19 June 2017. ^ Walker, Childs. "'Biggest rivalry in sports,' Army-Navy will put spotlight on Baltimore". Retrieved 19 June 2017. ^ Malinowski, Author: Erik Malinowski Erik. "Dec. 7, 1963: Video Instant Replay Comes to TV". WIRED. Retrieved 19 June 2017. ^ a b Atkin, Ross (29 November 1994). "That Was the Rivalry That Was: Decline of the Army-Navy Game". Retrieved 19 June 2017 – via Christian Science Monitor. ^ Horne, Lisa. "JP Blecksmith: College Football's Greatest Pride". Retrieved 19 June 2017. ^ "Army-Navy game names three future sites". Retrieved 19 June 2017. ^ a b "Army hosts rival Air Force for Commander-in-Chief Trophy". Retrieved 19 June 2017. ^ "mcubed.net : NCAAF Football : Series records : Navy vs. Notre Dame". www.mcubed.net. Retrieved 19 June 2017. ^ "The Ties That Bind". Retrieved 19 June 2017. ^ "How Navy saved Notre Dame after World War II – the team's shared histories". 31 August 2012. Retrieved 19 June 2017. ^ Heinz, Matt. "The Intriguing History of Why Notre Dame Plays Navy Every Season". www.rantsports.com. Retrieved 19 June 2017. ^ "Notre Dame and Navy: Why We Play, Part 1". Retrieved 19 June 2017. ^ Writer, NANCY ARMOUR, AP National. "Notre Dame runs over Navy with 56-14 victory". Retrieved 19 June 2017. ^ a b "The Notre Dame Navy Football Rivalry // UHND.com". 6 October 2015. Retrieved 19 June 2017. ^ "Crab Bowl Classic: Maryland vs. Navy - Maryland Sports". www.marylandsports.us. Retrieved 19 June 2017. ^ "Navy-Rutgers is revival meeting". Retrieved 19 June 2017. ^ "mcubed.net : NCAAF Football : Series records : Rutgers vs. Navy". www.mcubed.net. Retrieved 19 June 2017. ^ "B1G East Football Future Non-Conference Schedule Review". Retrieved 19 June 2017. ^ Football: "SMU-Navy To Battle For Gansz Trophy: Schools Establish Traveling Trophy To Honor Coaching Legend". October 7, 2009. Naval Academy Varsity Athletics official website. Retrieved 2010-02-20. "SMU-Navy To Battle For Gansz Trophy: Schools Establish Traveling Trophy To Honor Coaching Legend". October 6, 2009. SMUMUSTANGS.com. Retrieved 2010-02-20. ^ "mcubed.net : NCAAF Football : Series records : Navy vs. SMU". www.mcubed.net. Retrieved 19 June 2017. ^ "mcubed.net : NCAAF Football : Series records : Navy vs. Pittsburgh". www.mcubed.net. Retrieved 19 June 2017. ^ DiPaola, Jerry. "Pitt vs. Navy matchup played 50 years ago was one for the history books". TribLIVE.com. Retrieved 2017-02-14. ^ "2015 Military Bowl". Military Bowl presented by Northrop Grumman. Retrieved 2017-02-14. ^ "Winsipedia - Pittsburgh Panthers vs. Navy Midshipmen football series history games list". Winsipedia. Retrieved 2017-02-14. ^ "Let's Learn From the Past: The 1976 Pitt Panthers". Pittsburgh Post-Gazette. Retrieved 2017-02-14. ^ Hall of Fame Index (by sport). Naval Academy Varsity Athletics official website. Retrieved 2010-11-10. ^ Bailey, Steve (August 22, 2008). "In Annapolis, Md., the Past Is Always at Hand". New York Times. Retrieved 2011-01-08. ^ See United States Naval Academy#Halls and principal buildings. ^ a b See Navy Midshipmen#Facilities. ^ "Navy Midshipmen Future Schedules". FBSchedules.com. Retrieved March 5, 2019. This page was last edited on 26 March 2019, at 00:26 (UTC).